Israeli Prime Minister Benjamin Netanyahu warned Tuesday that he was ready to order further action in the Hamas-controlled Gaza Strip after airstrikes in response to rocket fire. "I can tell you we are prepared to do a lot more. We will do what is necessary to defend our people and to defend our state," Netanyahu told the US pro-Israel lobby AIPAC by video link from the Jewish state's defense headquarters. Netanyahu cut short his visit to Washington to handle the response after a rare rocket strike landed near Tel Aviv, injuring seven Israelis, just two weeks ahead of elections. Israel hit back with air strikes including on the office of Hamas leader Ismail Haniya, with an Egyptian-brokered ceasefire failing to take hold. Before returning home, Netanyahu enjoyed a key pre-election boost when he met Monday with President Donald Trump who proclaimed that the United States considered the Golan Heights -- captured by Israel from Syria during the Six-Day War in 1967 -- to belong to the Jewish state. Pointing to Jewish historical roots in the Golan, Netanyahu told AIPAC: "Israel holds the high ground and we shall never, ever give it up." Netanyahu again hailed Trump -- who in 2017 fulfilled another long-held Israeli ambition by moving the US embassy from Tel Aviv to disputed Jerusalem. But Netanyahu, without criticizing Trump, also denounced anti-Semites around the world including those who "march through the streets of Charlottesville." White supremacists rallied in the Virginia city in 2017 where they chanted slogans against Jews and an assailant killed a counter-protester, with Trump facing criticism for saying the neo-Nazi crowd included "very fine people." Netanyahu is facing a stiff election challenge from centrist former military chief Benny Gantz, who brought the American Jewish audience to its feet Monday with promises of an inclusive Israel. 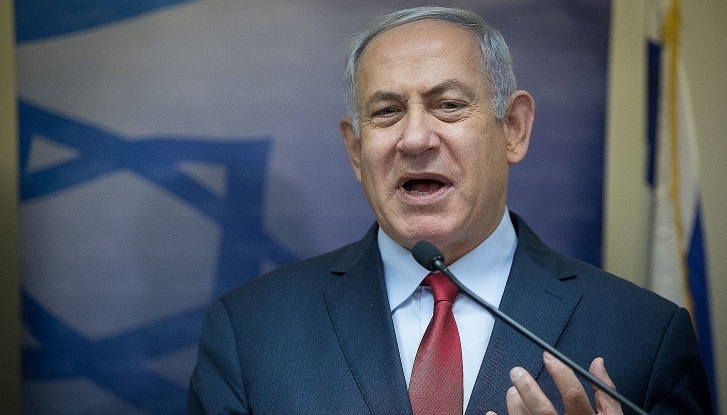 Netanyahu's pre-election dealings with the far-right Jewish Power party, which calls for the forcible expulsion of Palestinians and Israeli Arabs, has triggered condemnation even from AIPAC and other staunchly pro-Israel US groups. Netanyahu cast a moderate image for himself at AIPAC, saying that both Israel and the United States "love freedom and democracy." "We don't judge people by the color of their skin, their religion or their sexual orientation," Netanyahu said. "I'm proud of Israel's vibrant democracy where no one -- no one -- is a second-class citizen. All of Israel's citizens are first-class citizens," he said.